If you’ve read any articles on this website or browsed any of the documents, you may have noticed the attribution MSS #107. MSS #107 is not a secret code relevant only to scholars. MSS #107 belongs to all of us. It’s what brings us together. The records live on the right set of shelves in the middle of the column closest to the wall. (This storage area is not open to the public.) These shelves show clearly the difference between a library, which contains published books, and an archive, which contains unpublished, one-of-a-kind records for events, people, and organizations. 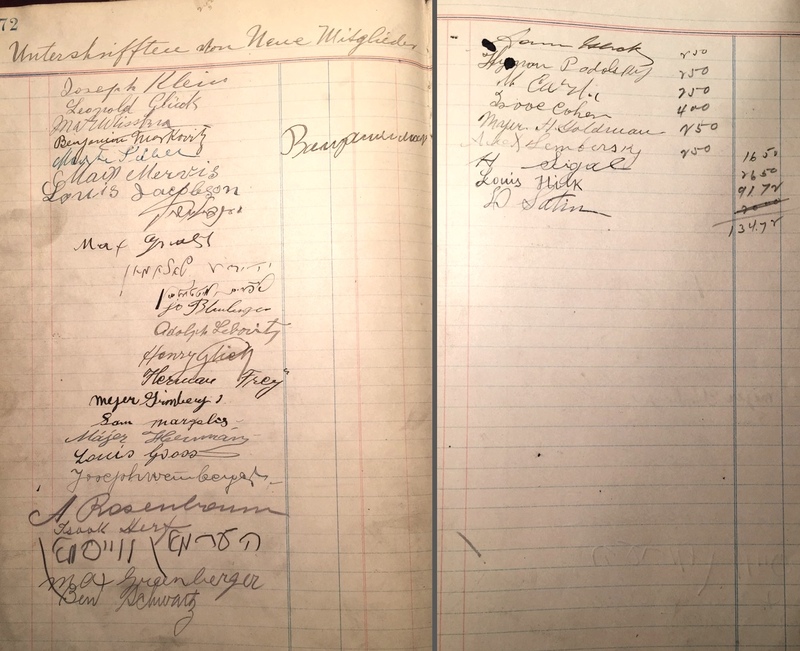 The History Center has a rich and growing collection of records documenting Jewish life in Western Pennsylvania in general and the synagogues of the region in particular, making it an ideal home for the records of Homestead’s former synagogue. I don’t know in what state our records arrived in January 1993, but in the past year I’ve seen other synagogue collections arrive as undifferentiated piles of papers and books and pictures and ephemera. Even the donors may not realize all that they boxed up when the time came to hand over the history of their synagogue to its new stewards. 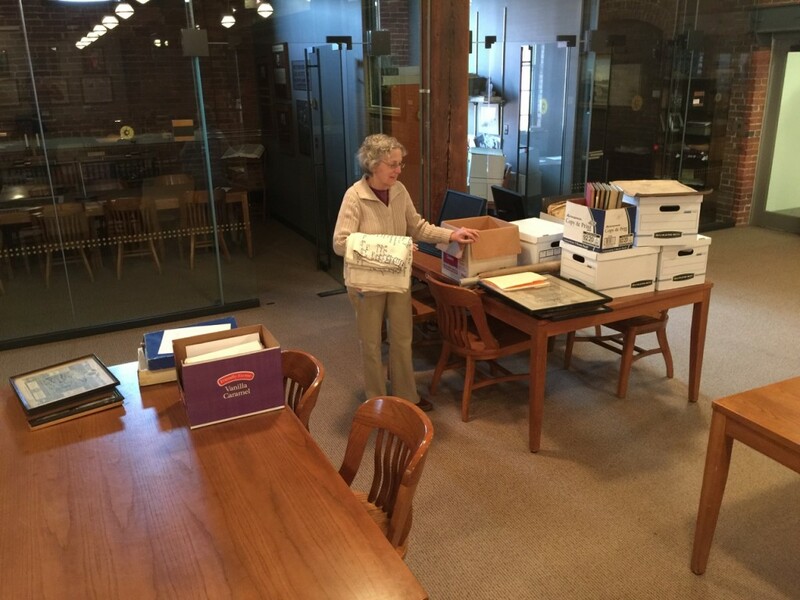 Archivist Susan Melnick with a set of newly-arrived synagogue records from Temple Israel in Uniontown (November 2015). 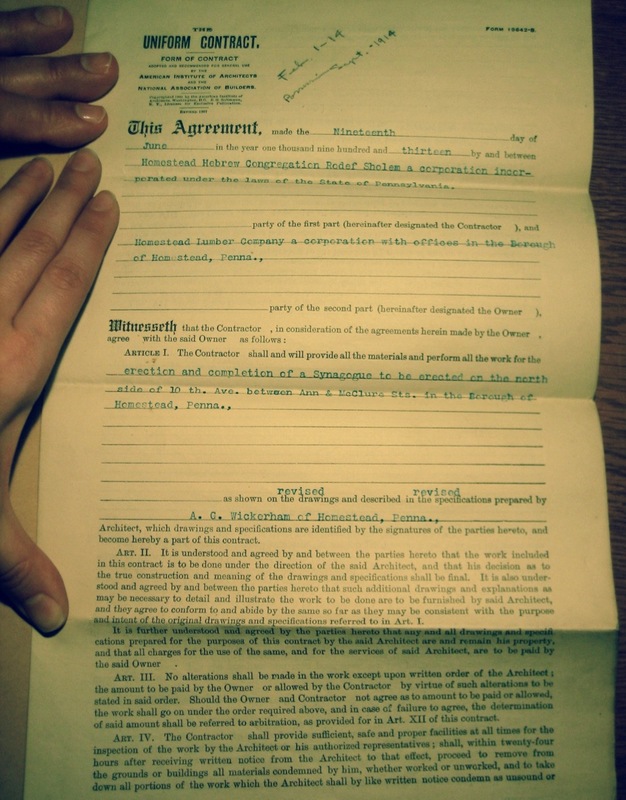 A trained archivist is responsible for reviewing the decades of accumulated material. At a high level, her task is to find patterns in the papers. She groups similar items together, orders them by date and theme, and then divvies them up into boxes subdivided into folders. The larger the collection, the more complicated it is to impose order onto chaos. Think about the state of your own filing cabinet, and then multiply from there. Corporate records can take years to process! Most of the boxes comprising MSS #107. To convey this organizational scheme, the archivist writes a finding aid, which is a sort of table of contents. Here is the one for MSS #107, but don’t let it fool you: beneath the orderly surface chaos still lurks. Half the fun of research is the suspense of never really knowing what’s in a collection until you actually get your hands on it. Each set of records is as unique as the people who created it. The archivist must find a way of concisely describing records that sometimes defy prior experience. The researcher, in turn, gets to crack open each short description to find the unexpected pearls that lie within. 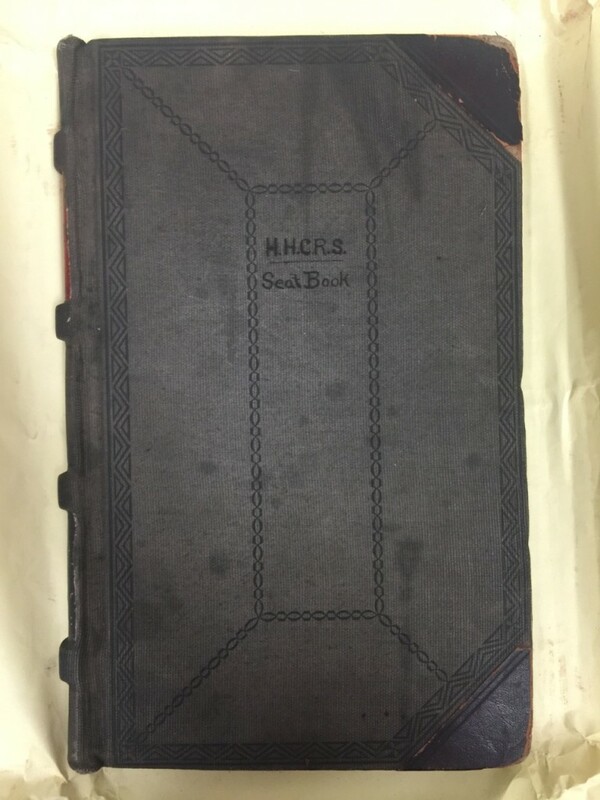 The Seat Book in front of MSS #107, Box 2. Old ledger books with weak bindings are enclosed in acid-free paper to better preserve them. For the researcher, it’s like unwrapping a present! 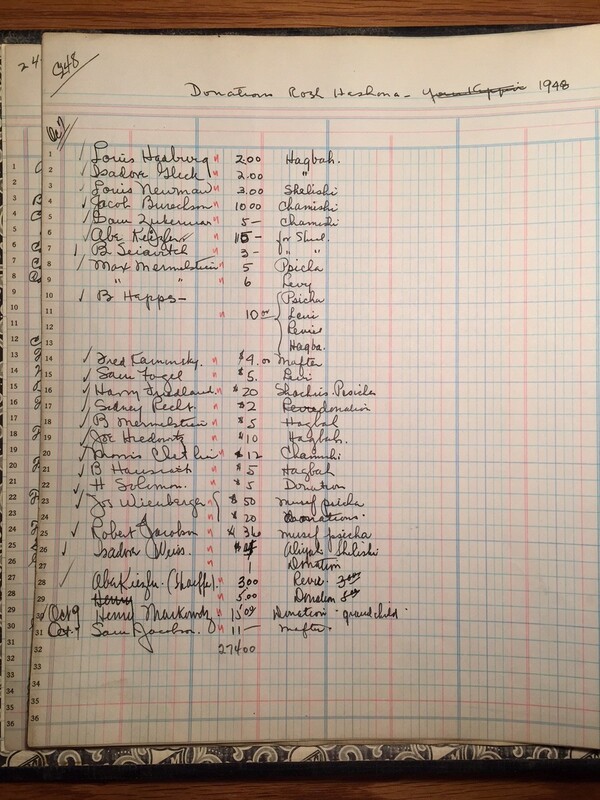 The inside of the volume reveals records of congregants buying and selling seats in the sanctuary. The pages for my great-grandfather, who purchased seats in 1901 at the first synagogue and in 1914 at the second. Other succinct names like “Ledgers of Individual Accounts,” “Collection Records,” and “Cash Books” sound fairly specific and maybe even dull until you start flipping through the pages and discover the delights within, such as a 1939 letter from a congregant claiming that even though his father signed him up as a member, he refused to pay; a 1909 deal between two congregants that if one defaults on a personal loan, the other will get his seat (he defaulted); the results of the early 1940s fundraising drive to pay off the shul‘s mortgage for its fiftieth anniversary; and so many more surprisingly personal details tucked amongst the columns of numbers. There are limits to what an archivist can do. Her job is not to catalog the contents of books or label individual documents. As a result, some descriptors are little more than the tip of the iceberg. In the Homestead records there are folders labeled “Miscellaneous Material,” each one gathering loose papers related to themes like financial matters, correspondence, meeting notes, and the chevra kadisha. A set of volumes labeled “General Ledgers,” each with a different date range, sounds like they could contain almost anything. Only opening these volumes and folders reveals the incredible diversity of material within. Sixteen boxes of material isn’t a small collection, but it isn’t large, either. The Westinghouse Electric Corporation, MSS #424, has 222 boxes! 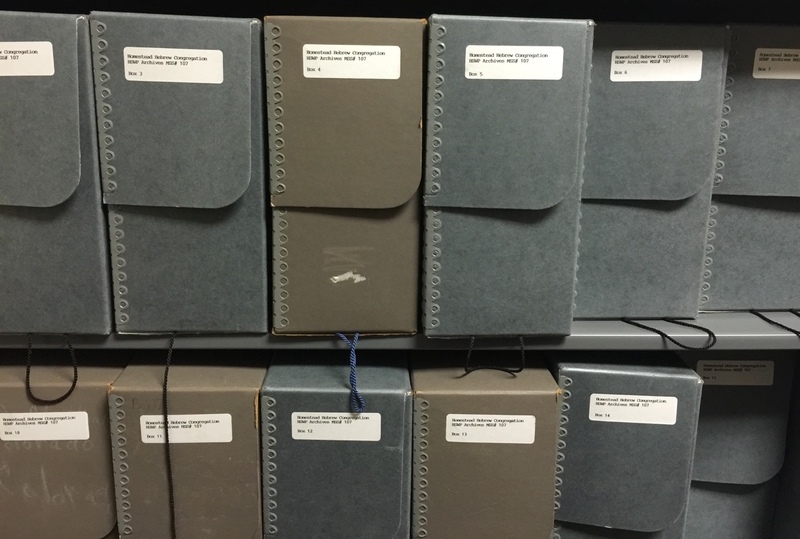 B’nai Israel on Negley, MSS #470, has 56 boxes, 13 loose volumes, and 3 oversized folders. 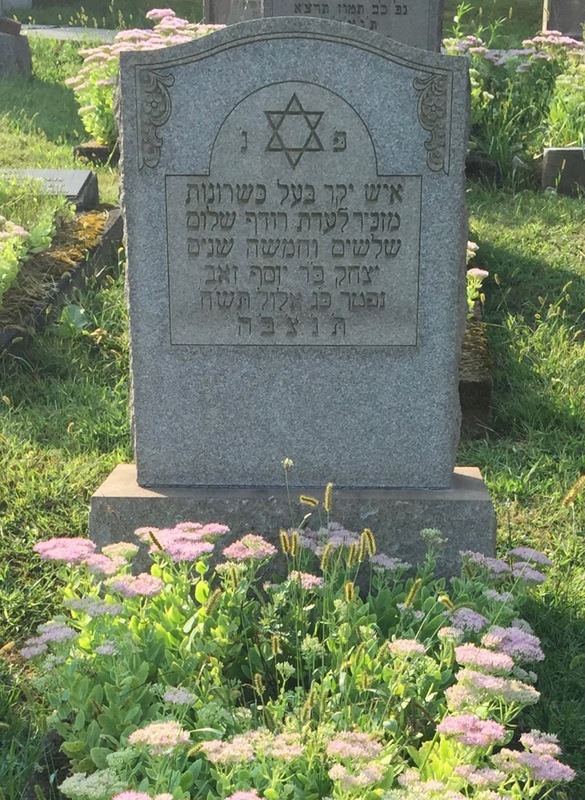 Beth Hamedrash Hagodol-Beth Jacob, MSS #438, in downtown Pittsburgh has 5 boxes and 73 volumes. On the other hand, Ohav Shalom in Donora, MSS #16, has three boxes, and some of the formers shuls in Braddock and McKeesport have only a few folders. 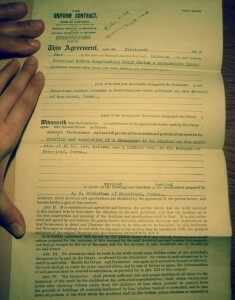 My father’s hand and mine flattening a contract from Box 3, Folder 8 so I can photograph it (April 2010). Sixteen boxes, I have decided, is a good size. If there had been fewer, I might not have been sufficiently excited by their potential to embark on this project. If more, I might have been too overwhelmed to believe I could get anywhere. 2 It’s not like I had any prior experience with archival records. When I first viewed MSS #107 in 2010, my father and I had only a few hours, so we requested to view the boxes with the earliest dates, plus a folder tantalizingly named “Speeches and Histories 1901-1934.” Because of the quality of the finding aid and the speeches and histories themselves, with very little effort we left with what we came for: the history of the congregation and my great-grandfather’s role in founding it. 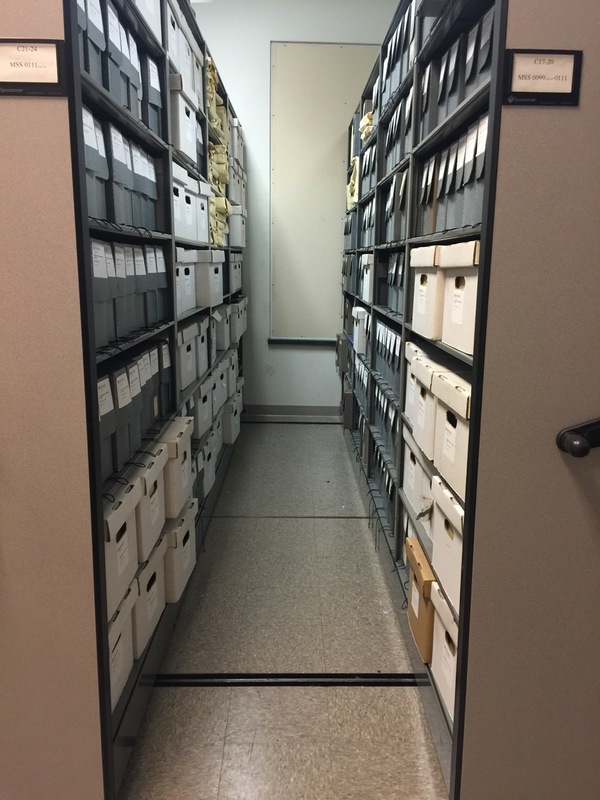 But four years later, when I returned to read all sixteen boxes from beginning to end to learn everything there was to learn, I realized that archival order does not mean research order. Box 1 Folder 1 contains the first of five financial ledgers listing mostly unfamiliar people being charged for unfamiliar items. If I didn’t start at the beginning, where was I supposed to dive in? The finding aid is silent on how to navigate the collection, because the archivist’s work leaves off where the researcher’s begins. 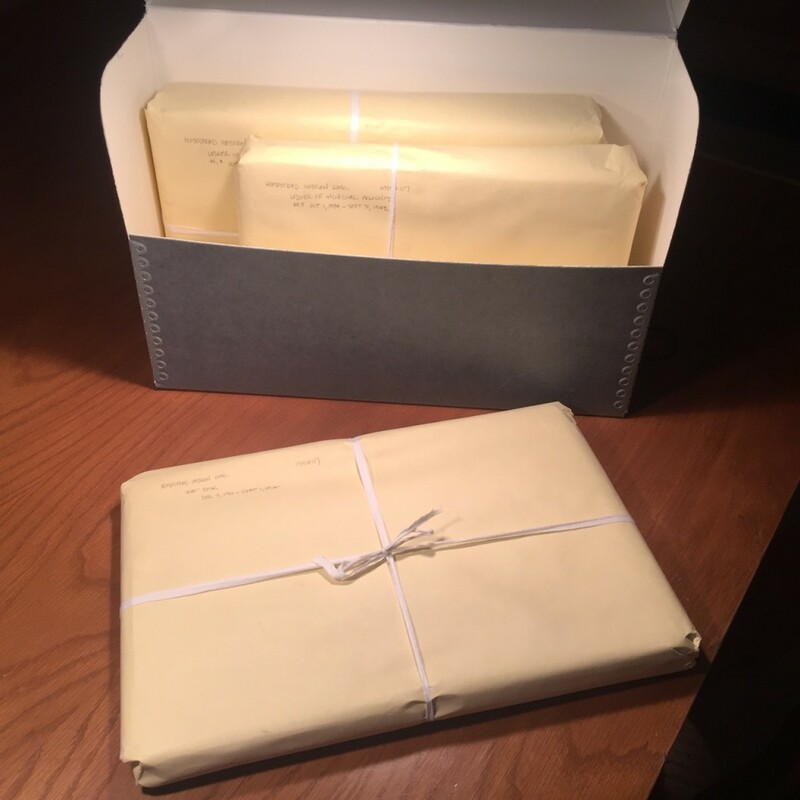 I decided that the likeliest narrative backbone for the collection was the meeting minutes that start at the end of Box 7 and run through Box 9 (covering 1920-1950 and1962-1978) . I read those first. Then I read the meeting minutes from the chevra kadisha (Box 13, 1924-1969) and the sisterhood (Box 9, 1945-1955), which provided parallel, but often intertwining narratives. As I learned the overall history through these minutes, I saw how to pull in the rest of the records in MSS #107 to elaborate on the people and incidents I was reading about. The impeachment of the financial secretary gave relevance to contemporaneous audit statements that presented an unbiased view of his purported shortcomings. Discussions around hiring, evaluating, and compensating rabbis were complemented by the actual contracts they had signed. And the competitive membership drives during a fractious period in the early 1920s are detailed in account ledgers which confirm what the minutes did not say: none of these people was serious about joining. Once I knew what I was looking for, even the records that had seemed most irrelevant were suddenly filled with illuminating answers. As I began to spend more time with the driest records in the collection, I realized I had been only half-right in my initial approach to MSS #107. I had begun by focusing on the records likeliest to tell the story for which I came, but MSS #107’s unique contents provided answers to questions I wasn’t asking and didn’t even know to ask. 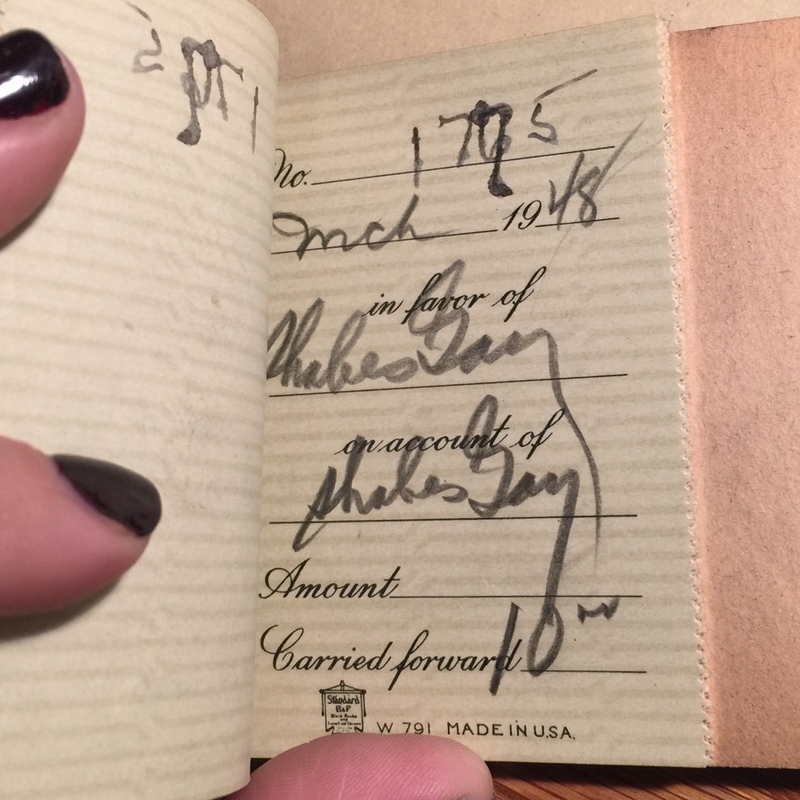 For example, the earliest financial ledger (1902-1916), which had answered the various questions I had brought to it — the impact of the 1911 fire, the timing of the 1913-14 synagogue construction, and the identities of the earliest rabbis — also provided answers to questions I wasn’t asking about synagogue membership. Scanning the book, I saw that in those early years most of the people who made donations, bought high holiday tickets, and paid for funerals were not paying dues. 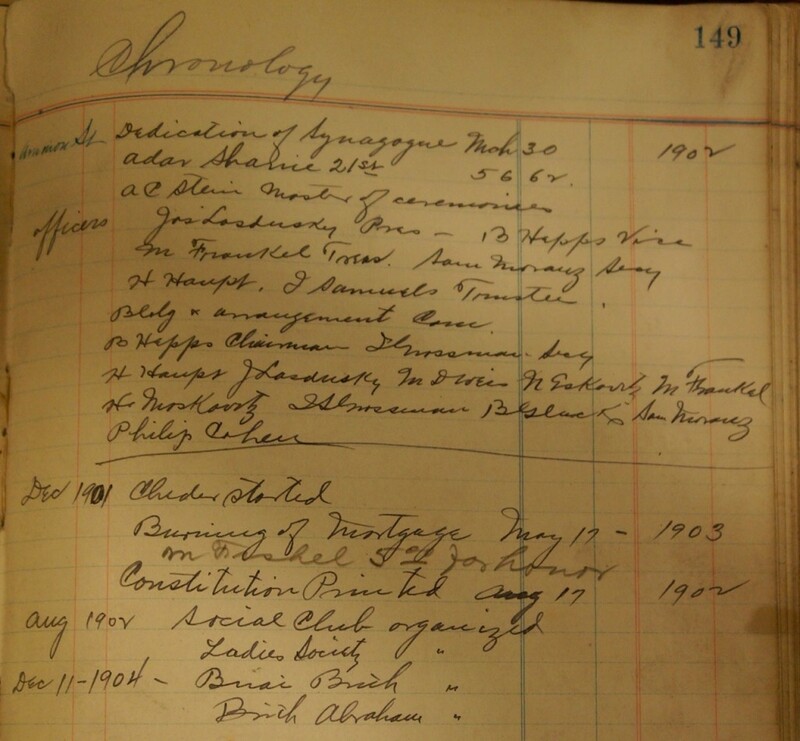 Applying today’s engagement model to the turn-of-the-last-century, this ledger showed me, distorted the picture. This reversal in research methodology is akin the gameshow Jeopardy: the records were giving me unanticipated answers for which I had to brainstorm better questions. By reading the records on their own terms, and not my own, a whole new layer of the story revealed itself to me. Since that 1902-1916 financial ledger spans a time period for which there are no meeting minutes, only a sparse chronology from the speeches, there isn’t much to weave together. Non-narrative records like this one had to become the backbone records before 1920 and between 1951-1962, even though they preserve only the faintest traces of the events that occurred. The members and employees, the income and expenses, the tsedekah in and out — each item hints at a forgotten story, and together they form a picture of the community’s operations and priorities that goes beyond mere math. Similarly, finding out anything about Homestead’s other Jewish organizations, for which almost no records of any kind survive, required extracting all their traces from mentions of joint events, donations, space rentals — even prorated shares of the telephone, mimeograph, and laundry bills. Even in the periods for which there are richer records, ephemera like check stubs, election ballots, donation cards, report cards, and scattered correspondence shines bits of light in unexpected directions. The more closely I looked at these secondary records, the more I found clues to otherwise elusive aspects of Homestead’s Jewish history (though not all). 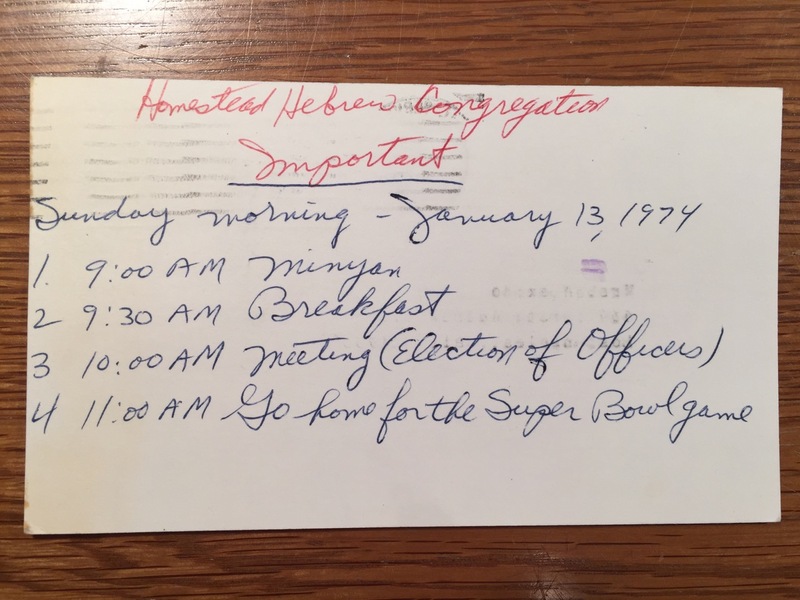 We Homesteaders are incredibly lucky that decades of synagogue secretaries did all the right things to ensure that decades of records were left on a shelf for the last generation of members to find. 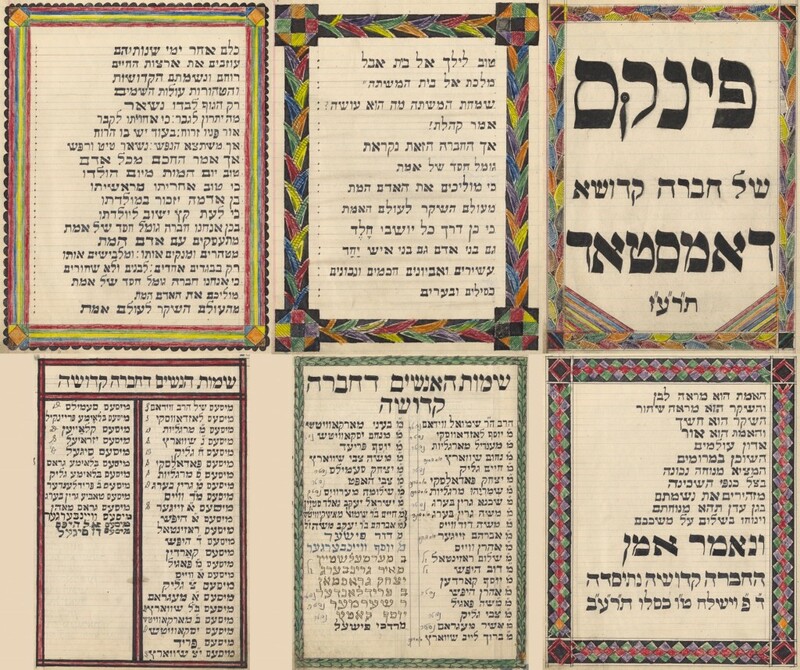 When I compare MSS #107 to other synagogues’ record collections, both larger and smaller, I realize that we’re also lucky that the creators of these records did such fine work. Our meetings minutes are written in complete sentences and paragraphs, not disjointed notes. 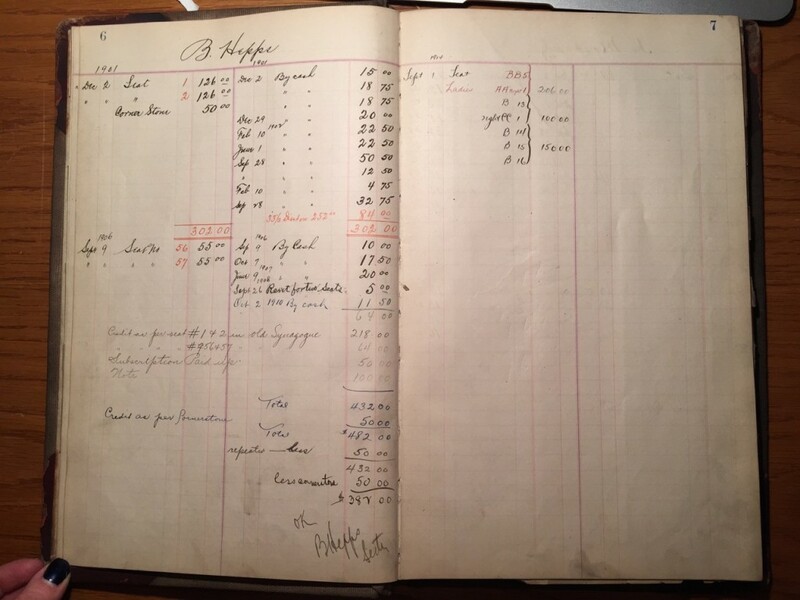 Our account ledgers are organized and detailed, not inscrutable tabulations. 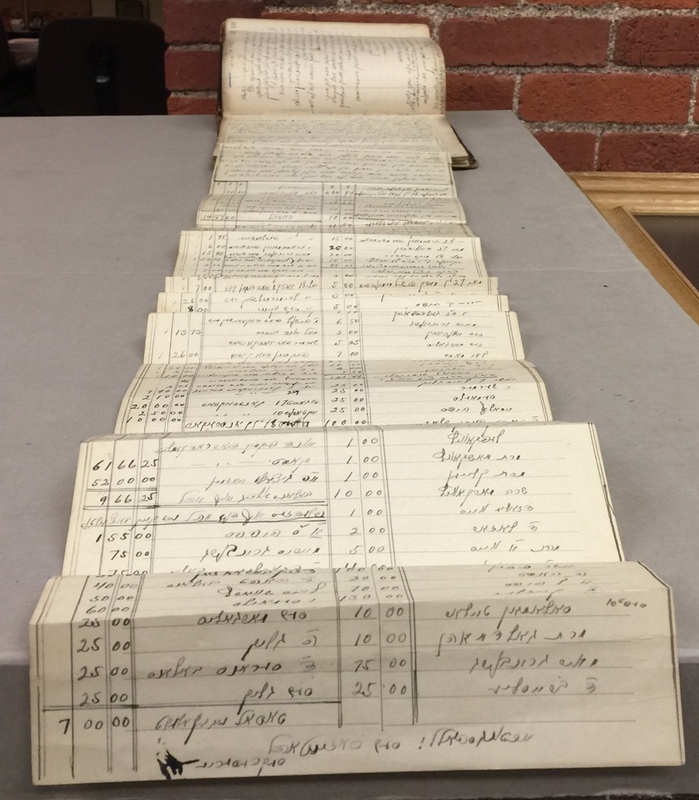 But more than the quality of these standard records, MSS #107 also includes records that don’t usually appear in collections such as this: speeches and histories and chronologies and lists that exist outside of the day-to-day record-keeping and immediately make the whole corpus more accessible and meaningful. And the main reason for that is one man. Ignatz was not the first or the only secretary (and he wasn’t always the best — I was very sorry when the young lawyer who introduced the typewriter in the late 30s got shipped off to war). But the bulk of the materials in MSS #107 are in his hand, he set standards that endured, and crucially, he alone had his eye on posterity. He was the person the congregation called upon when it needed to understand its own history. 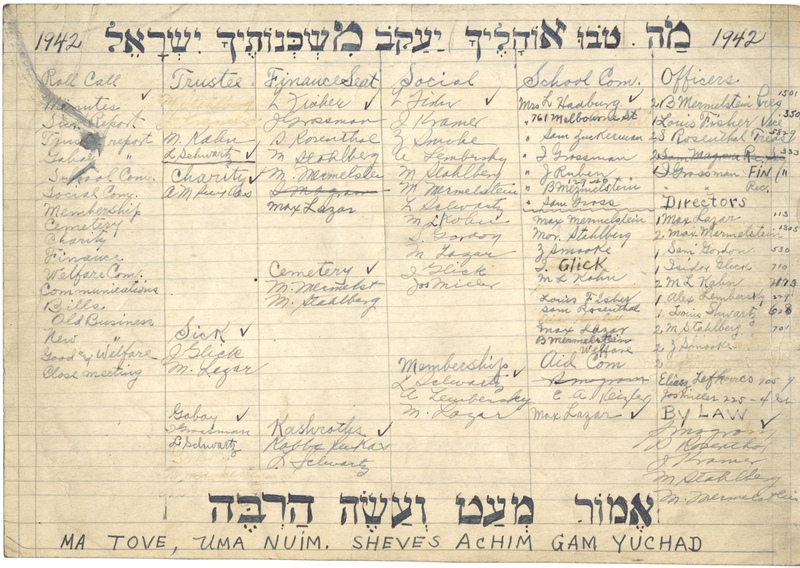 The speeches and chronologies and lists he produced in response were often copied twice or even thrice into the synagogue’s official records to ensure their preservation. Excerpt from Grossman’s chronology (Box 4, Folder 1, p. 149; also copied into Box 4, Folder 2). Other lists he created cover soldier boys and dedication participants. Would you believe that seventy-four years ago the Pittsburgh Jewish Criterion reviewed his work and agreed?! 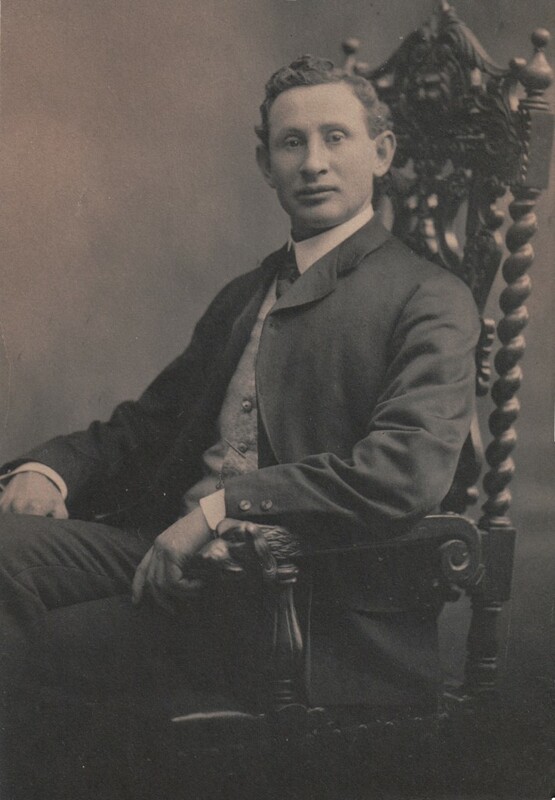 The secretary of the Congregation has held that office for the past thirty-one years; Isaac Grossman, brother of the first secretary of the Congregation, has kept an almost Boswellian account of the growth of the synagogue. A diary in the form of speeches written in vivid style that makes humorous, interesting reading even today, it is the sort of record one wishes could be found in the archives of every synagogue. Thanks in large part to Grossman, MSS #107 is a rich collection, but it’s not the only surviving source for the synagogue’s history. At no point in my research did I use the synagogue records in isolation. 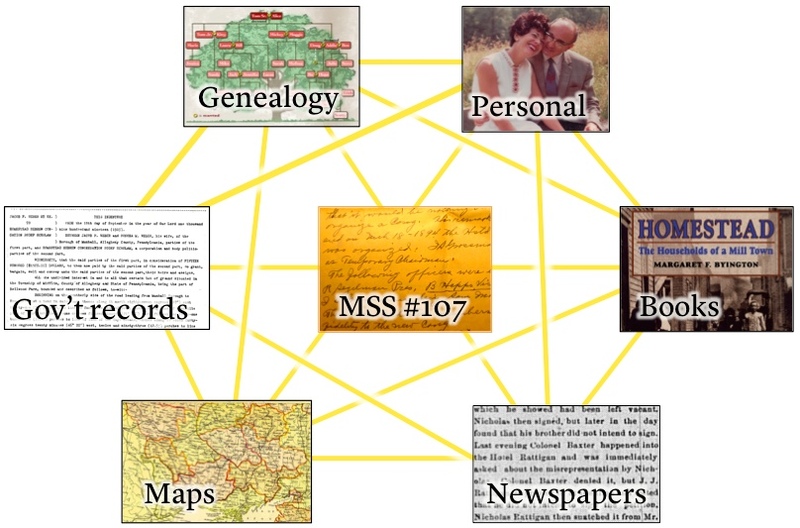 In the same way that I had to braid together all the different subsets of synagogue records, I also had to extend the weave to include a large variety of external records. If I saw a name of a congregant, I used censuses, vital records, immigration records, tax records, and city & business directories to find out who he was, what he did, where he came from, and who was in his family. If I read about a significant event, I checked the town’s newspaper, the Pittsburgh Jewish newspapers, and the Pittsburgh city papers from that date for another perspective on how that event unfolded. 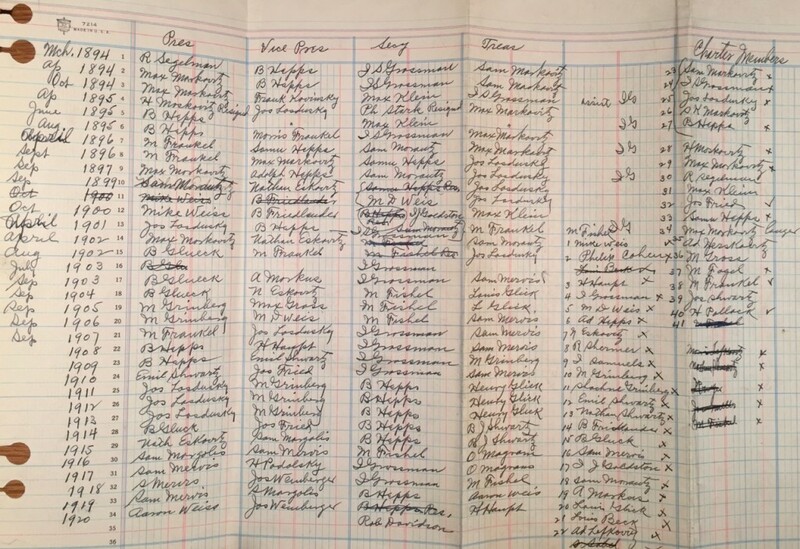 The synagogue’s 1894 charter produced a government record I could pull from an Allegheny County office, as did their various purchases of land for the synagogues and cemetery. Sometimes there were even lawsuits to look up! On many occasions unfamiliar historical references led me to articles and books and even other archival collections that filled in the missing context. And, of course, the memories and pictures you share with me, plus the oral histories from 1993, continue to add a tremendous amount of color. Amongst all these sources, though, the synagogue records remain the primary hub from which my research missions originate. Each of the longer articles on this website is an attempt at a small tapestry weaving together what all of these sources say on a particular theme. I am far from the only researcher who has had her hands on MSS #107. That initial visit by my father and me in 2010 has been repeated by many of you, I now know, who also came with modest questions about your family members. 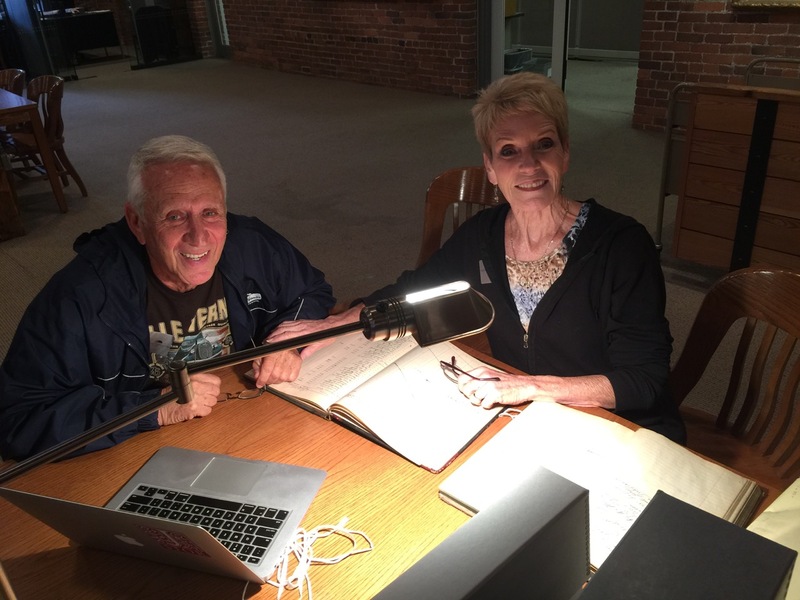 In fact, at the History Center I encounter many people looking for their roots in collections like ours. Yet another way in which we Homesteaders are lucky is that the bulk of MSS #107 is essentially lists of people who participated in the community in some way, so you’re unlikely to come away empty-handed. For all the layers of narrative and meaning I’ve teased apart, underlying everything are the people who made the community what it was. It was one of your relatives or mine who raised money or got in an argument or distributed matzo or shirked his dues or sang in the choir or ran for the board or lodged a complaint or got in trouble for taking the Shavuot flowers even though that is what everyone else had been doing for years so leave poor Sam Rosenthal alone, won’t you?! our forebears, who made us what we are. Without MSS #107, we Homesteaders would understand so much less about them and their world and, as a result, ourselves. Cousins from my Donora branch read about their family members in that shul’s records. MSS #107 is a great collection, but mysteries remain. Can you help me find these missing records? “Boswellian” —- Now that’s a word you don’t see every day. (see quote from the Pittsburgh Jewish Criterion, 9/11/42). My great-grandparents are Emanuel Weiss and Sara (Charlotte) Klein. The are from Hungary. Your tree came up on my Ancestry. Do you have more information on Sara’s family? I believe she is buried in Montefiore Cemetery in Jenkintown, PA.